Renoir's Great Bathers can be seen by some as the picture of female sensuality and beauty. To others, they embody a whole tradition of masculine mastery and feminine display. Yet others find a feminine fantasy of bodily liberation in the bathers. 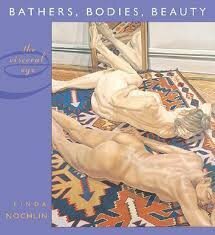 Linda Nochlin explores the contradictions and dissonances that mark experience as well as art. She confronts the issues posed in representations (particularly of the female body) in art from the impressionists to the postmodernists. Nochlin analyses artists like Manet, Cezanne, Bonnard and Picasso and late 20th century and contemporary artists like Philip Pearlstein, Alice Neel and Jenny Saville. She explores grotesque imagery, the concept of beauty and the body in realism and incorporates readings from differing strongly-expressed female viewpoints. Her own vantage point is subtly charted through a long-time engagement with art, art history and artists. Bathers, Bodies, Beauty brings to bear a lifetime of observing, teaching and wrestling with art, to reveal and complicate the lived and felt - the visceral - experience of art.